a small bathroom (shower and bathtub) and toilets across the way. The living room is very spacious,thanks to the French windows you can marvel at the panoramic view of Nice and the sea.Enjoy these views from the terraces that skirt the pool and the holiday home,with sun loungers and parasols.In the calm of the hills you will be able to loose yourself in the tranquillity of the natural surroundings, only 15 minutes from the city centre, the seaside and the airport. Close to all the amenities: bakery shops, restaurants, tennis courts and petanque courts. Activities: table tennis, barbecue, junior football, basketball etc. I was born in Italy, but have lived in France with my family for over 25 years. I speak French, Italian and English fluently. 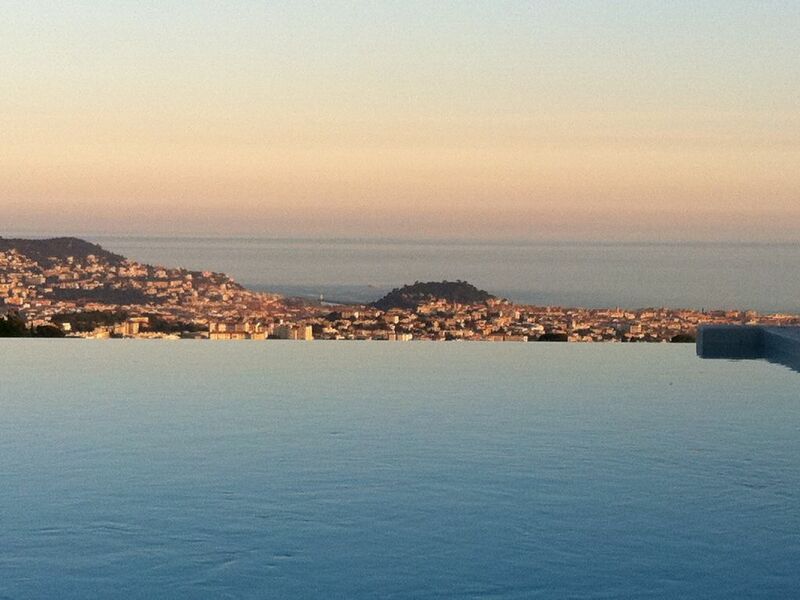 Located in the French Riviera, sea, clear skies, sun, a large house, a lot of space for everyone! We celebrated our 40th wedding anniversary by spending two weeks at the villa with our son and his wife, and our daughter and her husband and our four grandchildren. The villa was perfect for three families, with plenty of space for everyone. The infinity pool was a favourite for everyone, especially with the view from the end. Villa was clean and very well equipped for ten people. We will miss our terrace from our bedroom, and seeing the lovely view from every room. Thank you Edoardo and also a big thank you to Lena who came in regularly to clean. We had a great time staying at the villa. Positively surprised of the size of the 5 bedrooms with en-suite baths. Great outdoor areas for different type of summer activities. My husband and I stayed here with our 3 daughters and my sisters family of 4 joined us for part of the vacation. We all had plenty of space. Both the inside and outside of this house are so amazing that it's hard to decide where to hang out. We loved it all and hope to be back!! We were 10 people who spent a really nice week in this house and the house was beyond our expectations. The house was large and spacious and the garden had many nice living areas and a large pool. We can definitely recommend others to rent this house! We were two families spending a week at the villa, we enjoyed the pool, view and the spacious kitchen. The terrasse was great both in the morning and the evening. The host Eduardo was very helpful and friendly. Eduardo booked us at the local restaurant Simons, we can recommend to go there, food is great. Try the local dishes. The location was also good, 20 minutes from the airport and the city centre. Skiing: Auron, Isola 2000, Valberg and Limone Piemonte are all within a one hour radius of the house.